We feel privileged as one of the leaders in manufacturing and supplying an exclusive range of Ladies Office Uniform. These are designed using superior quality fabrics which are sourced from the topmost vendors of the market. Our range comes in full or short sleeves, with or without collar and round or v-neck lines. With these have a smart appearance that can surely impress any women. Also, these are designed to compliment both jeans and skirts. Manufactured using top class fabrics, these have high tear strength. 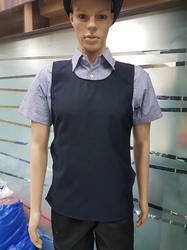 Our customers can purchase these ladies front of the house uniform shirts with full or short sleeves, with or without collar and round or v-neck lines. We offer Uniforms for House Keeping Staff in different colors, full and half sleeves, open & concealed buttons as per the requirement. These are available in maroon, blue, grey, camel, green shades in general. Any other color can be customized subject to quantitative orders. We offer a large assortment of intricately designed Hotel House Keeping Uniform that is highly appreciated in a large number of hotels. Our Hotel Housekeeping Uniforms are designed from the premium fabric to assure long lasting life. Hotel Housekeeping Uniforms offered by us are available in various colors and patterns as per the different needs of the clients. 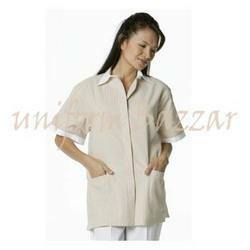 We hold expertise in offering a wide range of Super Market Uniforms. We offer uniforms for Departmental stores, chain stores, super market, drugstore, automobile showroom and many others. These are designed using pleasant colors teamed with the specified pattern to meet the requirements of the customers. We feel privileged as one of the leaders in manufacturing and supplying an exclusive range of Ladies Front Office Uniform. These are designed using superior quality fabrics which are sourced from the topmost vendors of the market. Our range comes in full or short sleeves, with or without collar and round or v-neck lines. With these have a smart appearance that can surely impress any women. Also, these are designed to compliment both jeans and skirts. Manufactured using top class fabrics, these have high tear strength.